Officially outside the town of Breckenridge boundary, the homes in this subdivision are located on a hillside above French Creek, which is to the south, and above Gold Run Gulch to the north. High, and rural these large lots could have a great view of the Breckenridge Ski Resort, and opportunities on the trails near any home or lot for sale in Western Sky Ranch . All of Western Sky Ranch - homes or lots for sale - will come with substantial acreage, and the opportunity for great views and privacy. The Western Sky Ranch homes for sale are custom-built, new houses. Extensive planning has gone into the homesites in this neighborhood and as it is built out, there will be more amenities and community. Discover more about living in the subdivision, or start your search with the Western Sky Ranch For Sale Listings found below. Located on a jeep roads and trails that runs from French Creek to Gold Run Gulch. You could hike or bike out the door of any home built here. 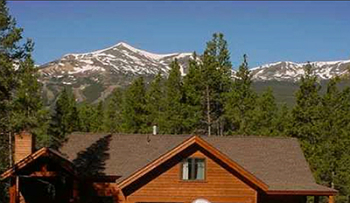 It will feel miles from town inside a home at Western Sky Ranch, but the drive to downtown Breckenridge is about 5 mintues, and will bring you first to the north side of town, and getting out of town - to I-70 - you'll avoid Breckenridge. On this side of town, the northside, is the Breckenridge Rec Center and stops for the free town bus are in French Creek. Many backcountry trails for biking and hiking begin or cross French Creek, and many trailheads are just a few minutes drive from Western Sky Ranch. Western Sky Ranch is accessed from French Creek Road, so from the north side traffic circle head north to CR 450, or Huron Road, or as locals call it French Creek, at the Y take the less traveled road, the left and head up toward Huron Heights. The homes in this subdivision will be the ones on large lots after you see the entry sign.